Learning to coupon can be SUPER confusing. Particularly when you have no idea what to start with. Figuring out how to coupon can actually be really simple when it’s broken down into smaller pieces. And today I’m going to make the first step to becoming a couponing pro easy on you. What’s the first step you ask? That would be getting familiar with store coupon policies. …is so that you can AVOID conflicts at the register. Know your stuff and you’ll know how to match coupons with sales for CRAZY good deals on the fly. And if there IS an issue at checkout, you can confidently challenge a cashier’s decision by asking for a manager. The main goal is to facilitate fuss free transaction after fuss free transaction. Seasoned couponers know that there’s nothing better than a coupon deal that goes off with out a hitch. Below, I’ve rounded up the 5 most common stores to coupon at. The store coupon polices is provided for each one, as well as my own guide for the store. In my store specific couponing guides I break down ALL the “rules” and make them easy to understand. This of course makes it all that much more manageable to digest. And that’s what we are aiming for here: a firm and complete grasp on store coupon policies. Pick just ONE store to begin with. 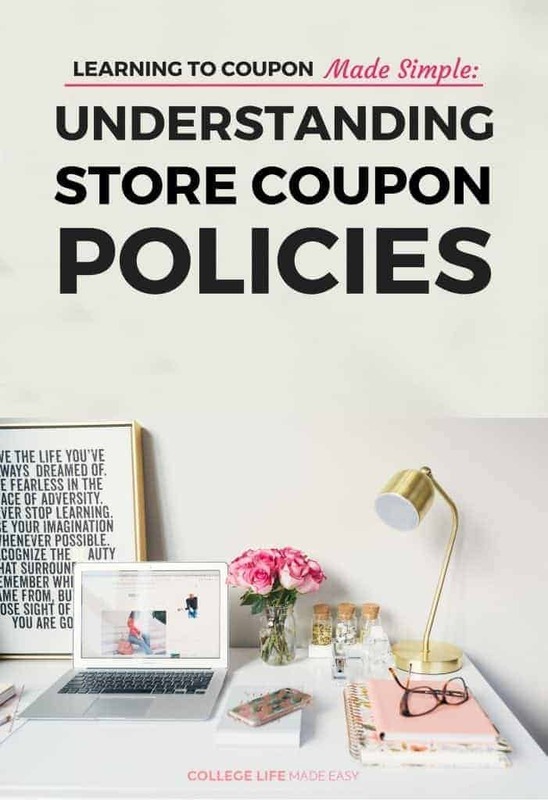 Learn that stores policies before trying to coupon at multiple stores. That may make it sound like it’s going to take EONS to learn it all. But, I want to reassure that it won’t – because it’s easy to pick up on. There is actually quite a bit of overlap between policies – learn one and you’re 80% of the way to knowing them all. So once the ball starts rolling, you’ll have it all down in no time. Want more direction? I recommend starting with my complete guide to couponing for beginners. 1 – Walmart is the only store that allows overage. If you use a coupon for $1.00 off and the price of item is 75¢, Walmart will give you back the difference. Yep that’s right – it’s like getting “paid” to buy that item! You can choose to take the extra via CASH or you apply it to the rest of your purchase. 2 – If you ever have a coupon that will not scan at a Walmart register, it is up to the manager to decide if they will accept it. Click here to see my beginner’s guide to couponing at Walmart, where I break down all the rules + provide you with extra money saving tips. Or head here to see the full Walmart Coupon Policy. 2 – Target has several types of coupons it accepts: mobile, cartwheel offers, Target store coupons and manufacturer coupons. 3 – You can use up to all FOUR types of coupons per applicable item, which would be called “stacking”. 4 – They are many offers where you earn a FREE gift card with certain purchases, as well. The value of your coupons will be adjusted down to NOT exceed the value of the gift cards you are earning, however. Click here to see my beginner’s guide to couponing at Target, where I break down all the rules + provide you with extra money saving tips. Or head here to see the full Target Coupon Policy. 1 – Rite Aid has in-store coupons that CAN be stacked with a manufacturer coupon. 2 – They also have a reward program called Plenti. With Plenti you can earn points that you can use the next day after 6am to buy products. 100 Points = $1.00. Click here to see my beginner’s guide to couponing at Rite Aid, where I break down all the rules + provide you with extra money saving tips. Or head here to see the full Rite Aid Coupon Policy. 1 – Walgreens has in-store coupons that CAN be stacked with a manufacturer coupon. 2 – Their rewards program is called Balance Rewards. You can earn points to use on a future purchase, but it has many rules so make sure to read up on it. Click here to see my beginner’s guide to couponing at Walgreens, where I break down all the rules + provide you with extra money saving tips. Or head here to see the full Walgreens Coupon Policy. 2 – At CVS you can earn rewards which are called ExtraBucks. Get weekly store coupons tailored to your spending habits at the Extra Care Machine. Click here to see my beginner’s guide to couponing at CVS, where I break down all the rules + provide you with extra money saving tips. Or head here to see the full CVS Coupon Policy. Note sure where to go from here? Check out my my complete beginners guide to couponing.